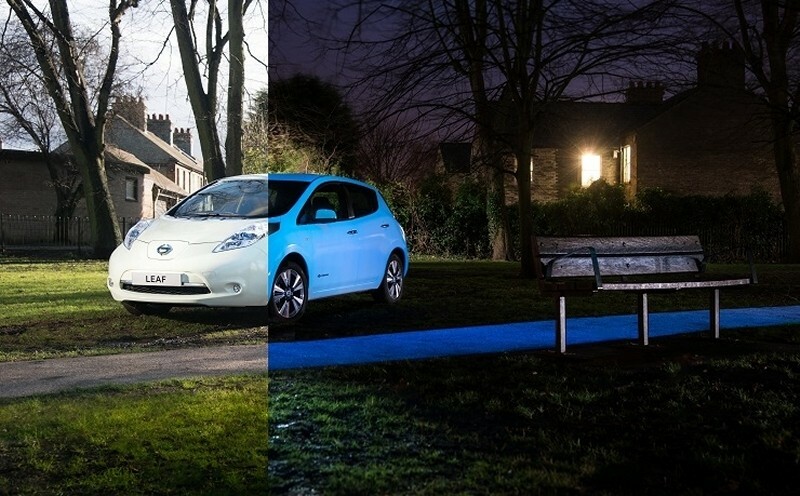 Nissan is experimenting with a new type of paint that makes its vehicles glow in the dark. Known as Starpath, the environmentally-friendly paint could afford drivers a bit more visibility after the sun sets – that is, if Nissan actually decides to release it. Glowing car paint and glow-in-the-dark wraps are readily available should you wish to trick our your ride but what the Japanese automaker is showing off is quite unique. The spray-on Starpath paint absorbs UV energy during the day which allows it to glow for between eight to 10 hours at night. It’s made entirely of organic materials and contains a natural earth product called strontium aluminate which is solid, odorless and chemically and biologically inert. Nissan claims the paint could last for 25 years when applied to a car. While the effect appears to be similar to what’s used on roadways in the Netherlands, I was unable to find any evidence that the two are using the same technology. Nissan has a knack for producing unusual paint. Just last year, the company unveiled a super-hydrophobic and oleophobic paint known as Ultra-Ever Dry. This special paint is capable of repelling water, dirt and even oil from a car. It works in much the same way as Scotchgard protects upholstery. If Nissan could somehow combine that with this new glow-in-the-dark paint, we’d be in business. Unfortunately, Nissan’s press release failed to mention whether or not the special paint would ever be made commercially available to buyers.